Becoming the caregiver for an aging loved one can be a rewarding, fulfilling experience. But it can also be very draining and demanding. According to the National Alliance for Caregiving and AARP, nearly 44 million adults were family caregivers as of 2015. Most families take on caregiving to save money. With elder care facilities costing anywhere from $150 to $300 per day, it is easy to see why more families are opting to bring their aging loved ones into their home. Do I have the financial stability? Caring for a loved one yourself is much more affordable than paying for respite care, but that doesn't mean it's free. It's important to consider all the possible costs involved, as well as if and how much the individual being cared for can contribute to the family's needs. Additional in-home nursing care or a home aide, which can cost an average $18-$19 an hour. Possible renovations or additions to make your home more accessible. The need for specialized equipment, such as shower seats, toilet bars, hospital beds, and wheelchair ramps. Time off from your job. Even with reliable hourly nurses, life happens — and if a nurse is a no-show, you could be forced to call out from work. Do I have the bandwidth? Caring for an aging parent is not the same as caring for a child. You can't always include them in your daily errands or the family vacation. Even simple things like running to the grocery store or dropping kids off at school can be hindered if the individual you are caring for cannot be left alone. Consider how much time you really have to be a caregiver, especially if your loved one has frequent medical appointments they need transportation for. How will this affect the rest of my family? Spending quality time with a loved one in their last years can be a special time for the whole family. However, individuals dealing with Alzheimer's or chronic pain have a harder time filtering their words and actions. Are you and your family prepared for the stress and potentially hurt feelings that may come with the situation? Not only do you need a strong emotional support system, but you will also need help to care for a loved one. Do you have other siblings or family members that are willing to step up and help, both financially and physically? Even young adult grandchildren, nieces, or nephews can sit with a loved one for a few hours a week to give you a much-needed break or time to run some errands. 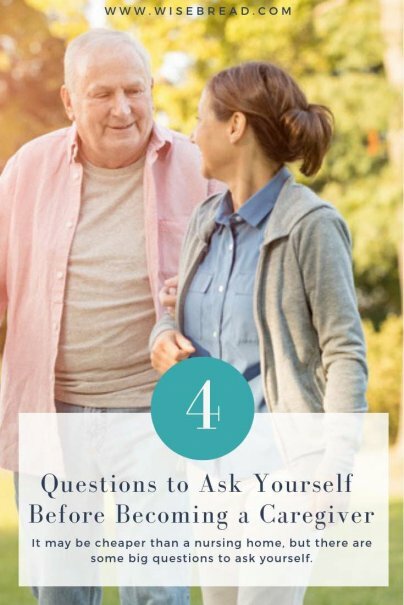 If you can't find anyone to help in your caregiving tasks, do you have friends, family, or neighbors who are willing to offer a hand in other areas, such as dropping kids off at school or bringing over the occasional meal? It is important not to spread yourself too thin — your loved one is depending on you, so avoid burnout as much as possible.